Hi! 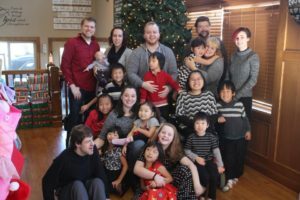 My name is Lisa and I started this blog because we have had the pleasure of having many people pray for our family as we adopted. They have continued to cover us in prayer as we proceed through the multiple surgeries and hospitalizations that our children are going through. I wanted a way to share our family’s story with those who have been following. I also wanted a way to journal for my children where I could easily add pictures. I have 16 children – one who is deceased. Out of those 16 children, two are healthy, the rest have/had medical conditions ranging from being deaf to missing a left ventricle. We have adopted 11 – 10 from China and 1 domestically. I have been married for 32 years to my high school sweetheart, Dan, who also just happens to be my best friend. I am lucky enough to be able to home-school my children. I have been through many trials in my life, but I am so blessed. What I want most for people to take away from this blog is just that. I start and end my day praising a God who has blessed my life in ways that I could not even imagine. I am seriously blessed. Kyle (passed away at 5 days of age) was Codey’s twin and was born with Beckwith Weidemann Syndrome. What I wouldn’t give to have even one more day with him. Each day that I live brings me one more day closer to seeing him again. He has taught me lessons too numerous to mention, but I will list a few. He taught me to love each day and those I love with my whole heart because you do not know the number of your days. He taught me to forgive and forget. He taught me what grace means and what true faith means. Psalm 139:6 (NIV) Your eyes saw my unformed body. All the days ordained for me were written in your book before one of them came to be. Zachary (30) married Stephanie on March 14, 2014. He has a Master’s in Interactive Entertainment. He works on a little game called Call of Duty, you may have heard of it. Zachary and I shared many great adventures while his dad was in medical school and residency. He & I continue to have a very close relationship, but Zachary has started on a new adventure in his life as shown by the family picture above. Zachary and Stephanie now have two children, Nicholas and Meredith. Zachary was a gift from God that healed so much of my heartache. Psalm 30:11 (NLT) “You have turned my mourning into joyful dancing. You have taken away my clothes of mourning and clothed me with joy. Cassandra (25) married Reece on May 31, 2015. She has her elementary education degree from Iowa State University and teaches at Walnut Street Elementary. She is pursuing her masters in speech pathology because of Max and Maisey. She was the answer to a mom’s prayers. I had always dreamed about having a little girl. I could not have been blessed with a better daughter. She is a joy and one of my best friends. 1 Thessalonians 5:16 Be happy (in your faith) and rejoice and be glad-hearted continually. Hope (19) has Hypoplastic Left Heart Syndrome. Hope recently started attending the Aveda Institute. She is a sweet, beautiful, artistic, video game loving little girl. She dreams of being a special effects make-up artist and her instagram is dragonknightmakeup. We were blessed to adopt her, at birth, while my husband was a Fellow at the Uof I. What a gift that was. My husband called to tell me that there was a little girl, who’s adoptive parents have decided not to adopt her because of her heart defect, and asks how I would feel about adoption. God works in truly miraculous ways. She is a blessing! Jeremiah 29:11 For I know the plans I have for you, declares the LORD, plans for welfare and not for evil, to give you a future and a hope. Jasmine or Shuang Shuang (19) has spinal muscular atropy (SMA). She has had a spinal fusion, and though she is unable to move by herself, is doing very well. She is a sweet soul who is so good with little kids. She has the best smile ever. She lights up the room with that smile. She is happy and easy going. She loves having a big family and is the reason our family has chosen to adopt again. Jasmine writes her own blog which can be found at www.flowerthatblooms.com She hopes to raise awareness about life in the orphanage and adoption. Grace (13) has Sytemic Lupus Erythematosus with Class IV/V glomerulonephritis. She is in 6th grade and is doing really well. Grace is an old soul. Her faith in God is unbelievable. She constantly amazes me. Gracie has her very own Facebook page “Hats for Gracie” started by a friend of mine. She loves that people are praying for her and she shared her hats with her “chemo buddies”. Gracie’s page and disease have been in remission for over a year now. Elyse (13) has spina bifida. We arrived home on January 1, 2015, with Elyse. She has personality galore just like Gracie and Evie. She will fit in just fine in this family. She has amazed all of us acquiring English. She was already reading chapter books with only a year of English under her belt. Elyse has a love for God and life that is remarkable. She is truly an amazing child who wants to change the world and even though she was told she was worthless in the orphanage she now believes she CAN change the world! Jessica (11) has scoliosis, lower limb paralysis and kidney failure. Elyse saw Jessica’s picture and knew that she was her sister. She soon had the whole family agreeing that we needed to hurry and get Jessica home. We have been busy getting her ready for her kidney transplant. She is stable right now with her kidneys functioning at about 12-15%. Our hope is to keep her off of dialysis and go straight to transplant. She is a beautiful, quiet soul and is a wonderful addition to our family. Benjamin (10) has a congenital heart defect TGA/VSD/ASD – not corrected until age 5 – and pulmonary hypertension. We were told before adopting him that there was nothing that the surgeons could do. After we were home, the doctors offered palliative care. We were advised to get a second opinion from Boston Children’s hospital and after consulting with them and having two surgeries, BEN IS HEALED! What a wonderful spirit this little boy has. He wouldn’t talk for days when we first got him, he just observed and took everything in. He was so happy from the minute Dan picked him up at the Registration Office. He wouldn’t let Dan put him down. He learned to say Dad within a couple of days and would just giggle as he yelled it at Dan. He played and played and played. He was a very sick little boy, but what a fighter he is. I’m a lucky, lucky mama to be able to love this little guy! Every day is like Christmas morning with Ben. He is just so happy to play and love others. Max (9) has bilateral microtia. We arrived home with Elyse and Max on January 1, 2015. He is a sweet boy who is non-verbal, and was taught no form of communication until he came home after the age of 6. He now knows 300 signs. There are still a lot of issues with Max but he has made great strides, the biggest being – learning to give and accept love. He is happy and loved! Maisey (8) is profoundly hard of hearing and has bilateral microtia. What a sweet little princess she is. What she lacks in being able to communicate she makes up for in faces. She is the most animated little thing I have ever seen and I have some very animated little girls. We recently got her a bone conducting hearing aid. It was a marvelous day watching her face as she heard. She has trusted and loved from the moment she saw us. I can’t believe that a child who has been through as much as she has can just let it go. My heart overflows with love for her. 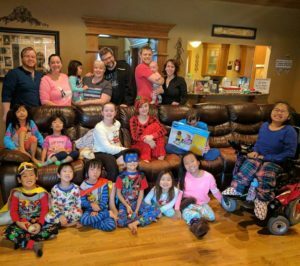 William (8) has spina bifida. We adopted this sweet little boy with the best smile on February 17, 2016. Dan saw his picture and knew instantly William was his son. The best part is 3 months before Dan saw William’s picture, Ben told me that he had a 5 year old brother in China that we needed to go get. When Ben saw William’s picture, he screamed, “That’s my brother. Who found him?” William is doing well medically but has had a harder time adjusting to family life because he loved his foster family. He has made great strides over the past year and says he loves America and his family now. He is a charming, handsome little boy. Lainey (8) has PKU. What a sweet, sweet little girl she is. She loves to cuddle on your shoulder and give you love pats. She has come so far in the short time she has been home. Lainey was very, very scary when she came to us in China. She has gone from a little girl who cried non-stop and banged her head on the floor to the most loving child. She will never be able to live on her own but the strides she has made are truly, truly amazing! Anyone who really knows her before and after knows just what I am talking about. When we met her in China we wondered if she would ever even understand love and now she lets you know just how loved you are without saying a word. Evangeline (Evie) (7) has a single ventricle. When we got her at the registration office on May 13th, she weighed a whopping 13 pounds and was not able to sit alone. She runs and sings and dances all over the house. She had her second open heart surgery in October of 2014 and came through it with flying colors. She continues to keep us all laughing with her funny antics. This girl has the BIGGEST personality and boy does she know how to love. Elijah (6) has pulmonary atresia. God has done amazing things in 2013 and Eli was added to our China trip where we adopted 4 at one time. Eli’s paperwork from the orphanage said he was “charming and handsome” over and over again and guess what?!?! They were right. He is charming and handsome. What a blessing it was to be able to bring this little boy home. Dr. Hanley performed a total repair (unifocalization) in November of 2014 and Eli has done amazing. The boy with no main branch pulmonary arteries who was considered terminal in China is now healed. Everyday I am greeted by the sweetest voices saying “good morning mama” and every night I am hugged and kissed good night by the sweetest souls. I am blessed to be a part of their stories and have had a front row seat to God’s miracles. What a life we have been allowed to live.